Intrepid Group is now the world’s largest adventure travel company, this year marking its 30th year of operation. Adam Bishop examines how the company’s Co-Founder Darrell Wade has influenced its long-term success. When presented with the dilemma of starting his own company or taking up an attractive job offer from an old boss, ironically it was Darrell Wade who nearly chose the road more frequently travelled. 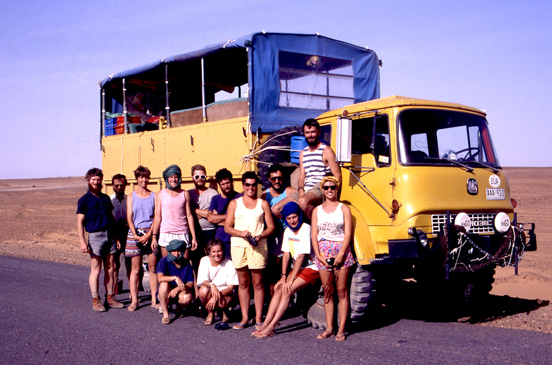 In fact, if it wasn’t for the brash candour of his wife back in 1988, he believes the adventure travel empire that we now know as Intrepid Group may never have been born. “I went home with this offer and said to my wife, ‘well, the travel company isn’t going to happen — it’s all over’ and she said to me ‘don’t be bloody ridiculous, you’ll be a pain in the arse if you don’t start a company, you were always going to start a company so what could possibly go wrong?’,” Wade recalls. Taking his wife’s steely wisdom on board, Wade decided to take the gamble of his life and founded Intrepid Travel along with close university buddy and fellow backpacking enthusiast Geoff “Manch” Manchester. The company was created with the raison d’etre of being “run by travellers, for travellers”, and to this day the authentic adventure travel spirit courses deeply throughout Intrepid’s various businesses. Three decades on, Intrepid Group is now the world’s largest provider of adventure travel experiences boasting more than 2,700 trips in 120 countries, operated by its four core brands; Intrepid Travel, Peregrine Adventures, Urban Adventures, and Adventure Tours Australia. As is so often the case when starting a fledgling business, Intrepid didn’t become an instant success story for the ambitious duo from Melbourne, a point Wade concedes when reflecting on the company’s infancy. In hindsight, Wade believes what he and Geoff had created in that first year was what he now describes as a “minimal viable product”, a business that was not yet fully formed but had the DNA of something potentially successful. Applying plenty of vision, passion, and perhaps a touch of naivety into the mix, Wade and his mate Geoff plugged away at trying to realise their dream of creating a travel company that delivered an authenticity not yet evident in the marketplace. Slowly but surely, the pair began building a reputation for difference in the Australian market, albeit accompanied by a few harsh lessons courtesy of some mistakes made along the way. “To be brutally honest, the first trips that we ran were pretty crappy,” Wade acknowledges. During that vulnerable first 12 months, Wade credits his clients for keeping the business alive, thankfully having just enough of them spruiking their Intrepid experiences to their agents, with Peregrine Travel in South Australia proving to be the company’s most important advocate. “We would’ve been sunk without them,” Wade believes. With the treacherous foundation phase gratefully in Intrepid’s rear vision mirror, the company soon found itself achieving a comfortable growth trajectory. Between 2000 and 2010, the business attained a compound average growth rate of 28%, a period of time Wade interestingly describes as “smooth but lumpy” — the lumpy bits referring to adverse external events such as the 9/11 terror attacks and the outbreak of the SARS virus for example. Notwithstanding forces outside of Intrepid’s control, Wade and his business partners were pleased to see the operation going from strength to strength and beginning to entrench its brand among adventure travellers. “We were just used to growing at a reasonable rate of knots; during that era we also started opening Destination Management Companies (DMCs), starting our first one in Vietnam,” Wade said. “I agreed to open 10 DMCs in the next six or seven years and now we’ve got 23 or 24 of them in different countries around the world and that has been a major part of our success,” he added. Despite the relatively smooth sailing, Wade felt the time was right in 2011 to look at a new direction and undertake a calculated risk by deciding to play ball with European travel giant TUI Travel. The British-headquartered behemoth had pursued Intrepid Travel as an acquisition prospect on and off for the previous ten years, however Intrepid had always resisted the idea of being bought out by a big multinational. Spying an opportunity to manage a suite of modestly performing TUI brands under its umbrella, Intrepid decided to form a merged entity with TUI Travel called PEAK Adventure Travel Group — to be 60% owned by TUI and 40% by Intrepid Travel. He reflects upon those next three or so years managing Peak with mixed feelings. “In some respects, it was amazing because the organisation was bigger and we learnt a lot… but what emerged after a couple of years was how different corporate cultures can be,” Wade laments. After persevering for three years and attempting to bridge the divide on big-ticket items such as corporate culture, strategy and technology, Intrepid ultimately ended its merger with TUI. Despite the turbulent period, Wade believes the learnings he made were invaluable and that it served as an important catalyst to refocus on what he felt were the important ingredients in the Intrepid business. “They were extremely risk-averse, and I think we are fairly risk embracing, so add all of those things up and it’s just a cultural mismatch,” Wade says. Following the split with TUI, Intrepid made the conscious decision to enhance its business model and gear it more strongly towards the concept of sustainability, or as Wade proudly refers to it, “growing with purpose”. Ensuring the ethical ethos extended beyond the realms of internal office rhetoric, Intrepid decided to kickstart a four-year process to become a “Benefits Corporation” or B Corp, an initiative which aims to make businesses across the globe a force for good. “Really it’s a glorified auditing process that goes right through the supply chain, the labour model, and it looks at why and how you benefit society beyond shareholder benefit,” Wade explains. “It took us four years to get that accreditation… internally, it means a lot to our staff that we have standards that we work to, especially given my partner and I are less and less active in the day to day business it’s really important that we set up a company that is enduring. We think businesses of the future are going to be enduring where they have purpose to what they do”. Forming a major pillar of its sustainable strategy is The Intrepid Foundation, the group’s not-for-profit entity that matches donations in order to fund important projects for vulnerable communities and individuals around the world. In 2017 the foundation marked a record year by raising $1 million for local and international charities and since its inception, has raised more than $6 million for more than 100-non-government organisations. The future appears bright for Wade’s Intrepid Group, the re-energised business recently posting its third consecutive year of record growth and notching up a healthy 17% increase in revenue. The EBIT result for 2018 came in at close to $15 million, thanks to a 25% spike in underlying profitability as the firm rides a surging demand for sustainable travel. Not one to rest on his laurels, Wade believes Intrepid can achieve more impressive financial milestones moving forward. “Intrepid was at about $120 million turnover when we went into that TUI arrangement…we came out of it with about $240 million in turnover, and next year we’ll be $500 million. We’re pretty confident that we’ll be $1 billion by 2025,” Wade posits. Financial projections aside, he predicts technology, food, the sharing economy, and new emerging destinations will be strong determinants underpinning the future success of the industry. Interestingly, Intrepid’s most successful single DMC is now in Morocco, making rapid gains from outside the company’s top 10 most popular destinations in less than five years. Croatia also represents another strong mover in its portfolio, a dynamic topsy-turvy landscape that Wade is quick to counter with some trademark philosophical musings.